Here are some of the photos I captured today of Space Shuttle Discovery flying over D.C. today on board its 747 carrier. The shuttle circled around D.C. a few times before heading for its final resting place at the National Air and Space Museum Steven F. Udvar-Hazy Center next to Dulles International Airport. The full moon will rise this weekend at nearly 90 degrees azimuth for those in Washington, D.C. That means the moon will be almost directly to the east. Since the National Mall and many of its famous monuments and buildings align along an east-west axis, the astronomical phenomenon promises stunning moonrises from places like the Washington Monument, the Lincoln Memorial, and the Netherlands Carillon as the moon slowly rises behind or next to the U.S. Capitol. If the expected clouds abate on Friday and the weather holds out, that is. On Friday, the nearly-full moon will rise in D.C. at 6:23 p.m. EDT at 89 degrees azimuth (source). On Saturday, the full moon rises at 7:39 p.m. at 97 degrees azimuth. And if the full moon due east isn't enough to pique your geeky astronomical interest, this weekend's moon will be a big and bright moon. Saturday, the full moon is at perigee -- its closest approach to earth. This perigee is the closest the moon will get to the Earth for all of 2011: 221,575 miles (356,575 kilometers). That's 31,064 miles closer than the moon was on March 6, according to EarthSky. EarthSky says Saturday's full moon will be its closest encounter with the Earth since Dec. 12, 2008, and the closest it will be until Nov. 14, 2016. For photographers interested in capturing the event, outside the Lincoln Memorial and the Netherlands Carillon should be good places to set up your tripod. (Tip: You might want to get to the Carillon early to stake out an unobstructed spot for your tripod. It's a popular place for full moon photos. Note that the path in front of the bronze lions is a popular one with joggers, bikers and pedestrians, so get your siteline set up with that in mind.) As far as weather goes, the current forecast calls for partly cloudy Friday around moonrise with a slight chance of rain. But sometimes a low cloud layer can make for great photos if the clouds aren't dense. Saturday also promises to be partly cloudy with some rain possible in the morning. But the clouds are supposed to clear by moonrise. Saturday promises to be the better day for weather but with the 97 degrees azimuth, perhaps less-stunning photos (more like the one below). I'm looking forward to some beautiful moonrises this weekend. Share the moment with someone you love -- but hey, take the camera. If you grab some good photos, please send me a link in the comments. For the past few months, tech publisher Manning Publications has impressed me with its marketing push by offering quick-strike discounts on print and ebooks. Until Manning's recent marketing and discounts, I was buying a Manning book maybe once a year, and I almost never bought it directly from the publisher. Instead, I'd usually check sites like BestBookBuys to find who had the title I was looking for at the best price. But with its steep short-term discount offers, and my newfound fondness for ebooks, I have purchased Manning books in recent months on Groovy, Grails, Spring and Ext JS, almost always buying the ebook version for $10 to $15 -- a great price for a tech book. In addition to improving its marketing and pricing, Manning also has impressed me recently by expanding its ebook file formats. Previously, Manning offered its ebooks only in PDF format. Earlier this month, Manning announced it will begin offering its books in the mobi and EPUB file formats. That's great for me because I like reading books in the mobi format on my BlackBerry using the free Mobipocket reader. Ebooks have won me over from the paper version of tech books because of their searchability, the ability to cut and paste code, and their ultra portability by being on my phone and laptop when I visit customer offices. The mobi format is also supported by the Kindle, while the EPUB format is popular with devices like Sony Reader, the nook and the iPhone. Keep it up, Manning. If you keep offering good technology books at great prices in flexible formats, I will continue to be a regular customer. The bloom of the Japanese cherry trees in Washington, D.C. is at its peak, so Renee and I went over to the Tidal Basin at dawn this morning to watch the sun come up behind the Jefferson Memorial. We got some nice photos. I was surprised at how popular the Tidal Basin was at 6 a.m. During the Cherry Blossom Festival, D.C. has turned Ohio Drive SW into a one-way street going north, with parking available on the west side along the Potomac. By sunrise at 6:47 a.m., there almost wasn't a parking spot left. There was a plethora of photographers lined up along the Tidal Basin walking path, all prepared with their tripods and telephotos. Renee set up her tripod near one tree, while I roamed around shooting hand-held, which made for a lot of blurry photos in the pre-dawn twilight. I shot at ISO 800 initially, then switched to ISO 200 in the hopes that it would let me blow-up the photos extra-large without as much graininess. Still, I was shooting at 1/30 of a second and slower for a lot of the early photos. That's what I like about shooting digital: I deleted about 60% of my photos with no thought to all the "film" I wasted. Visiting the Tidal Basin before dawn to enjoy the cherry blossoms was a good idea. The area around the basin was packed a couple of hours later, with the usual gridlock traffic on Independence Avenue SW and the Memorial Bridge entering the district from Virginia. If you're in D.C. and plan to visit the cherry blossoms on Sunday, definitely arrive early. I saw a lot of cars idling along the Memorial Bridge, slowly crawling toward D.C. -- and probably not finding a close space to park. I uploaded several of my photos from today and from last weekend to Picasa Web Albums. 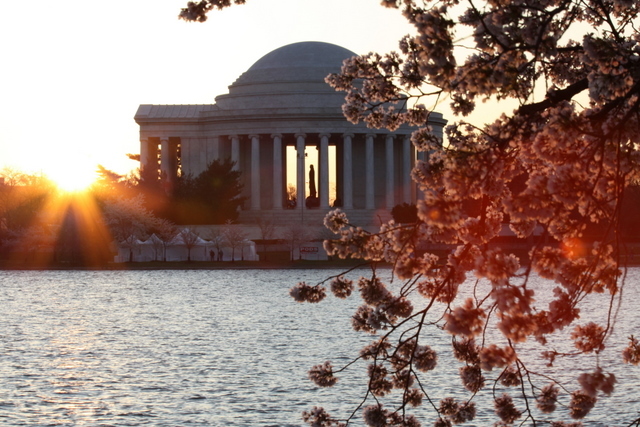 Some cherry tree facts: There are 1,678 cherry trees around the Tidal Basin, with more surrounding neighboring roads and parks. 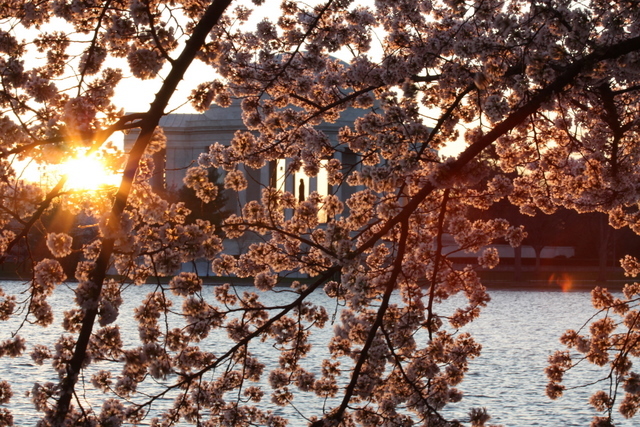 Trees originally were planted around the Tidal Basin in 1912 as a gift of friendship from the people of Japan. About 400 of the present trees were propagated from the original 1912 trees. The health of the trees often suffers as a result of their beauty. The crowds who visit the area often tromp around the base of the trees, compacting the soil. The drainage in the area could use some improvement, too, as you'll notice when you have to walk around some of the flooded areas along the Tidal Basin path -- forcing you to compact the soil even more around those trees. New trees need to be planted regularly to replace the suffering ones, which is probably one reason none of the trees you see there are ancient. If you are interested in planting a Yoshino cherry tree at your home like the ones along the Tidal Basin, the non-profit American Forests sells them online. My "green" plug for the planet. I created a Google Alerts to be sent daily to my Google mail account. I received daily emails for a week, then one day it stopped. Turns out Gmail filtered the Google alert to the Spam folder. When it comes to spam, Google doesn't even trust itself. After installing Fedora 10 last month, I finally got the Tomboy note-taking application working. I began using Tomboy in Fedora 8, and have several notes stored in Tomboy notebooks. When Tomboy broke in Fedora 10, I put it on my to-do list to figure out how to get it working. I figured the fix would be as easy as re-installing Tomboy. It wasn't. Until I saw the error, I didn't even know Tomboy was a .NET application running under Mono. I searched around for a solution to the problem and found the bug has been reported three times to Red Hat Bugzilla, but still no one has solved it. The solution, fortunately, was pretty simple, and was mentioned by Austin Acton in a bug comment. The solution also was mentioned on this blog post by Mark Ito (I'm assuming that's his name from the subdomain). The solution is to install mono-addins from the 'fedora' repository. For such an easy fix, you have to wonder why this 5-month old bug with high severity is still open. Tomboy comes as part of the standard Fedora 10 install. It must not be as easy as making the tomboy package dependent on the mono-addins package. 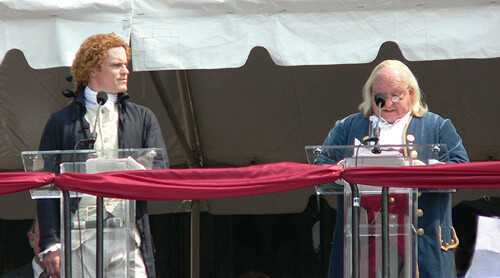 Yesterday saw another great celebration on the National Mall in Washington of our nation's declared independence. Two hundred thirty-one years ago, the Continental Congress adopted Thomas Jefferson's draft of the Declaration of Independence. Independence on the National Mall in Washington, D.C.
We began the morning at the National Archives, where the original Declaration of Independence is stored, for the annual dramatic reading of the document by men portraying three of the original signers: John Adams, Thomas Jefferson and Benjamin Franklin. Last year, the last couple of paragraphs were read by two men of our armed forces who were wounded in Iraq or Afghanistan. One of the men suffered head injuries, and his reading was stilted and slurred, yet he bravely read through the document. It brought tears to many in the crowd assembled on the steps outside the archives and spilling out onto Pennsylvania Avenue. This year, they brought a veteran of World War II to read the last part of the Declaration, and filmmaker Ken Burns talked about his upcoming World War II documentary, The War , which recounts the war from soldiers who fought it. I heard no mention of any active war going on, or of any of the men and women fighting in it. Iraq already seems like a war we're fighting to forget. 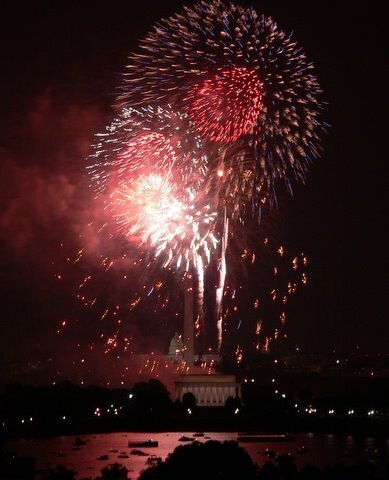 We watched a little of the Independence Day parade down Pennsylvania Avenue, walked through the exhibits and listened to music at the Smithsonian Folklife Festival on the Mall, then returned home in the afternoon to watch the fireworks from our balcony. At around 5 p.m., a lightning storm prompted police to evacuate the open areas of the Mall and the Marine Corps Memorial. Officers asked picnickers and others staking out seats for the concert and fireworks to seek shelter in the various museums and memorials. The storm passed through after about an hour, and the 8 p.m. concert at the Capitol began on time, as did the fireworks an hour later. Last year we watched the fireworks from the Lincoln Memorial. This year, we were able to enjoy the view from our home in Rosslyn. The fireworks show was great, as usual, but this year I thought it was marred a bit by two orbiting police helicopters, one to the east of the Mall and one to the west. Security was visibly tighter this year, the terror tenor of our times. And to put another damper on an otherwise perfect evening, three men who put on the fireworks display were hurt and burned, one seriously, when unexploded fireworks went off about 15 minutes after the finale. I was still looking toward the Lincoln Memorial and saw two or three fireworks explode at ground level. May the injured fireworkers recover fully. I left the real world yesterday to "attend" a technical briefing in Second Life, hosted by IBM, on what Web 2.0 means for business. I want to congratulate IBM for experimenting with virtual worlds. But in this case, the pretend physical nature of the online briefing detracted from the message and added nothing discernable. 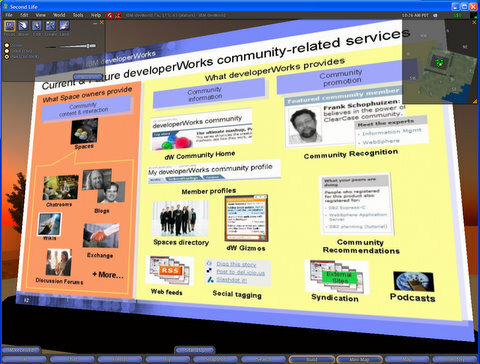 I spent more time fighting the Second Life client application than I did listening to the IBM presenters. The technical briefing had to begin a half-hour early to allow IBM and the two- or three-dozen attendees to work out the technical kinks, including the basics like learning to walk and sit in Second Life. For those who haven't heard much about Second Life, it is a 3-dimensional online virtual world in which everyone is represented by a (usually) human-appearing image you can move around using the Second Life client application. The virtual world allows you to see and interact with real people who also are visiting Second Life. Second Life includes isolated islands and a mainland filled with various structures and objects created by Second Life owners and visitors. Holding a meeting in a 3D virtual world promises new tools for collaboration. You could hold a main meeting, break out into smaller groups as needed while still easily rejoining the main group, share notes, share software, demo software on a virtual computer in the virtual world, and draw on whiteboards that can be stretched to fit your needs, using colored pens that never run dry. I'm unsure what capabilities Second Life provides today to do any of these things, but I don't think talking is one of them. Attendees to the IBM session had to dial a regular conference telephone line to hear the presenters. 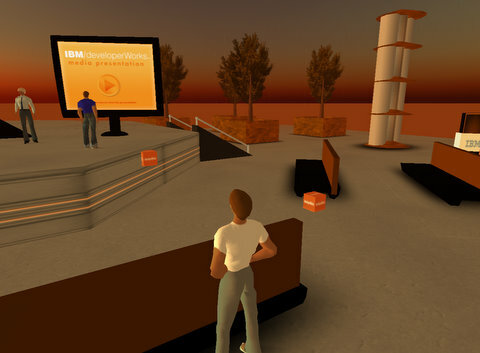 I say IBM struck out by holding this technical briefing in Second Life because the presenters merely talked, showed slides, and provided handouts. You don't need a 3D virtual world to do these things. The bad part was Second Life detracted from the actual content of the briefing by having to deal with virtual-world activities instead of merely listening, reading and thinking. First, I had trouble finding the conference room. The coordinates IBM provided took me to what looked like a sand-dune filled desert with a beautiful virtual sunset on the horizon. The only other thing I could see was one or two other virtual attendees walking around aimlessly. Flapping my arms eventually got me there. You see, the presentation was held on a platform floating in space above the ground. You had to fly up several meters to see it. (In Second Life you can fly.) Strike one. Second, the Second Life client isn't very stable. It froze and crashed while I was trying to move around. Strike two. the slide was in focus. Third, it was difficult to view the slides in Second Life. I first had to figure out what keystrokes I needed to zoom my vision onto the virtual projector screen. When I mastered that skill, I discovered the slides took a long time on my (fairly powerful) PC to paint and focus. Sometimes the slide would just start to appear on my screen as the presenter moved onto the next slide, which would blank out the slide I was frantically trying to read, and then the next slide would take 5 to 10 seconds to start painting on my virtual screen. Strike three. Fourth, Second Life forces you to create a new name for yourself while visiting. You can choose a first name, but you have to choose from a list of Second Life family names. As a result, you can't tell who the IBM speaker at the podium is without someone translating that "Foobar Frobney" (or whatever) is really IBM employee Alfredo Gutierrez. Strike, um, three and a half. Even though Second Life's virtual-world wasn't the best forum for this technical briefing, I want to give IBM credit for trying. Virtual reality holds promise for providing better, more natural tools for online collaboration than simple slideshows and telephone conference lines. However, IBM will need to learn to use the best tool for the job. If you are just going to talk and show slides, there are more effective technologies today than Second Life.